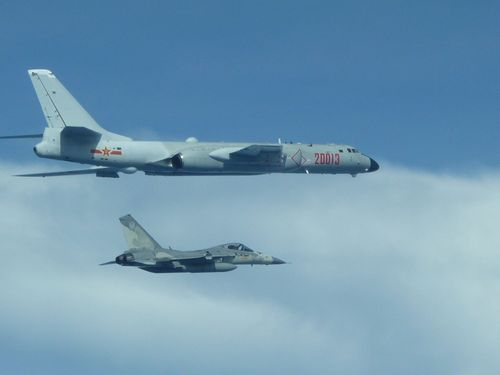 Taipei, July 21 (CNA) The Presidential Office said on Friday that the military and national security authorities closely monitored the movement of 10 Chinese military airplanes flying over the East China Sea a day earlier. On Thursday Japan’s defense ministry said it detected 10 Chinese military aircraft, including H-6K bombers, flying over the East China Sea, passing east of Taiwan and through the airspace of the Miyako Strait earlier that day. It pointed out that in recent months Chinese military aircraft and vessels have frequently passed through the strait. Miyako Strait, which runs between the Japanese islands of Miyako and Okinawa, offers a small strip of international waters and airspace through Japan’s exclusive economic zone. Presidential Office spokesman Sidney Lin (林鶴明) said on Friday that all Chinese military movements are closely monitored by the Ministry of National Defense and relevant national security agencies. The authorities have every advanced warning and countermeasures in place to enable them to defend national security if called on to do so, Lin said. Earlier the Ministry of National Defense released photographs showing two H-6K bombers, one of which was tailed by a Taiwanese Indigenous Defense Fighter jet. This is the first time the ministry has released photos of Chinese military aircraft. The pictures, taken by the Air Force, revealed that Chinese military aircraft entered Taiwan’s Air Defense Identification Zone (ADIZ). Asked about the Chinese military movements, Mainland Affairs Council head Chang Hsiao-yueh (張小月) reiterated that peace and stability are the two most important issues in cross-strait relations. Chang urged China to "look higher and further," making efforts together with Taiwan that benefit the people of China.